ALBUQUERQUE, NM--(Marketwire - January 25, 2011) - Last Wednesday, audio manufacturer Sennheiser hosted Senator Jeff Bingaman at its Albuquerque, NM facility, one of the most advanced wireless audio manufacturing plants in the world. Senator Bingaman, part of a bipartisan group of Senators who supported the America COMPETES Act, was joined by the New Mexico Manufacturing Extension Partnership (MEP) and the office of Albuquerque Economic Development (AED). During his visit, Senator Bingaman was given a tour of the facility, which has expanded its employee base eight-fold and posted over a decade of year-over-year revenue growth since opening in 2000. The New Mexico MEP has played an important role in Sennheiser's overall growth by delivering an array of training opportunities and providing support with its Lean Manufacturing suite of tools and services. "Sennheiser is to be commended for its impressive track record of growth over the last ten years," commented Senator Bingaman. "It is gratifying to see how MEP and Sennheiser have successfully cooperated to help drive job growth, in addition to providing valuable training opportunities for its employees. We are particularly excited to see how Sennheiser has benefitted by implementing MEP's Lean Manufacturing principles." The America COMPETES Act, legislation first enacted three years ago, dramatically increased the nation's investment in science and technology and put a renewed emphasis on mathematics and science education. Additionally, it reauthorized funding for MEP. Last month, President Obama signed legislation extending the law to help ensure that the U.S. retains its competitive edge. 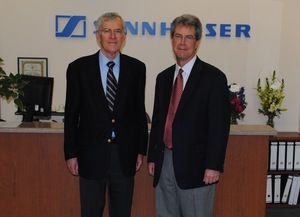 "We are honored to have hosted Senator Bingaman at our offices," commented Joe Fortuin, general manager of Sennheiser New Mexico. "From the beginning, our ISO certified facility has been focused on the quality of our systems, manufacturing processes and of course our employees. MEP has been integral in helping us implement effective employee training systems, which in turn have had a positive impact on business results." Sennheiser's Albuquerque-based plant manufacturers the company's wireless audio products including microphones, wireless personal monitors and wireless transmission systems. Its products are used around the world by stars like by Rihanna and Pink, as well as on programs like "American Idol" and "Glee." Since opening in 2000, Sennheiser New Mexico has played an important role in Sennheiser's growth as a global company, as well as the broader wireless audio industry. Sennheiser is a world-leading manufacturer of microphones, headphones and wireless transmission systems. Established in 1945 in Wedemark, Germany, Sennheiser is now a global brand represented in 60 countries around the world with U.S. headquarters in Old Lyme, Conn. Sennheiser's pioneering excellence in technology has rewarded the company with numerous awards and accolades including an Emmy, a Grammy, and the Scientific and Engineering Award of the Academy of Motion Picture Arts and Sciences. About this company Sennheiser Electronic Corp.
From left: Senator Jeff Bingaman (NM) and Joe Fortuin, general manager of Sennheiser New Mexico.